How to help a hydrocodone addict? You can help a hydrocodone addict by showing understanding and support during their treatment and recovery. Find out the best ways of getting help for a hydrocodone addict, here. Hydrocodone is prescribed for short-term treatment of moderate to severe pain. However, some people continue to use it long after a prescription expires…or in ways other than prescribed. Why? Because of the level of relaxation and mild euphoria that it creates. With repetitive abuse, many hydrocodone users develop a physical and psychological need for the medication. Are you or some you know struggling with hydrocodone addiction? Do you feel as if hydrocodone is taking control over your life? Hydrocodone addiction is treatable. Take hope in the fact that it is a medical condition and there are effective ways out of your problem. However low you or a loved one feel at the moment, addiction treatment works! 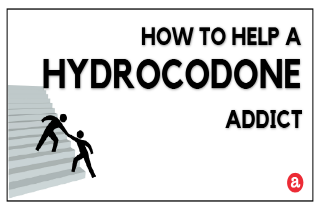 Here, we review what you can do to help yourself or someone else with hydrocodone addiction. Then, we invite you to ask additional questions or share your experience at the end of the article. Simply post to us in the designated comments section at the end and we’ll try to get back to you personally and promptly. Building connections with support networks that encourage sobriety. Eliminating hydrocodone from your system, which is done by the process called detoxification. Learning healthy techniques for problem-solving and stress-management. Understanding the psychological aspect of your addiction. But, these goals are not the only achievements a person in hydrocodone addiction recovery should strive for. In fact, treatment is different for every individual. That is why the program should be adjusted to his/her individual needs. How long is an ideal stint in treatment? Calculations about the exact duration of recovery cannot be made with accuracy, although programs usually last from 30 days and up to 120 days. Length of time spent in recovery is an effective investment for the future. Giving yourself 1-3 months minimum to focus on becoming and staying hydrocodone free can pay off the in long run! STEP ONE: Seek medical help. If you have a friend or a family member who is facing difficulties with hydrocodone addiction, should you try to help him/her withdraw from hydrocodone at home? In our opinion, the best advice you can give to a hydrocodone addict is to pay a visit to the doctor before trying to quit and to start with a tapering plan created by their physician or pharmacist. A tapering plan will help your friend to slowly decrease hydrocodone doses in order to escape unpleasant withdrawal or relapse. But, how can you even get to the part where you approach your hydrocodone addicted friend and express your concerns? Convey your feelings about their hydrocodone use and it’s effects on their life and health, and on your relationship. Refuse to protect them from the consequences of their hydrocodone abuse. Convey the link between the growing problem in their life and their drug use. Help them find resources for professional treatment and ongoing recovery support. Provide continuity of contact, caring and support through the stages of addiction, recovery initiation and the transition to stable recovery maintenance. In the end, the most important thing you can do is to provide support for a person in hydrocodone recovery. Remember, they will need you even after they enter treatment! So remind them not to give up and encourage them to continue their treatment because that’s the only way they can continue to live a normal and drug free life. One way to assess your hydrocodone addiction and to help yourself is to do an evaluation of your thoughts and beliefs. The way you think and you overview your addiction is very important. Changing how you feel by changing the way you think is a mindfulness strategy that can help you deal with mood and relationship problems, handle stress better, improve your self-esteem and become less fearful. There are a few key places where you can get help for hydrocodone addiction. Your first point of contact can be a trusted family member or your doctor. Doctors can help assess your state and create a tapering plan, as well as prescribe you medications that can help you during the withdrawal period. You can also get a referral for a professional hydrocodone detox center or addiction treatment facility in your area. Do you still have questions about helping a hydrocodone addict get treatment? Feel free to post your questions in the comments section below. We will try to respond to all legitimate inquiries in a personalized and timely manner. How do you get someone help that doesn’t think they have a problem? This person is taking around 160 narco 10’s a month. Hello,I find this article is very informative. It’s good that you are providing information and help on an issue which is often not recognized or is ignored. Many people with this addiction need help and this article might help them a bit.